Artifacts: 1. Canada World Youth Cultural Exchange, Volunteerism, and Community Development Program. 2. Picture with Ukrainian participants. 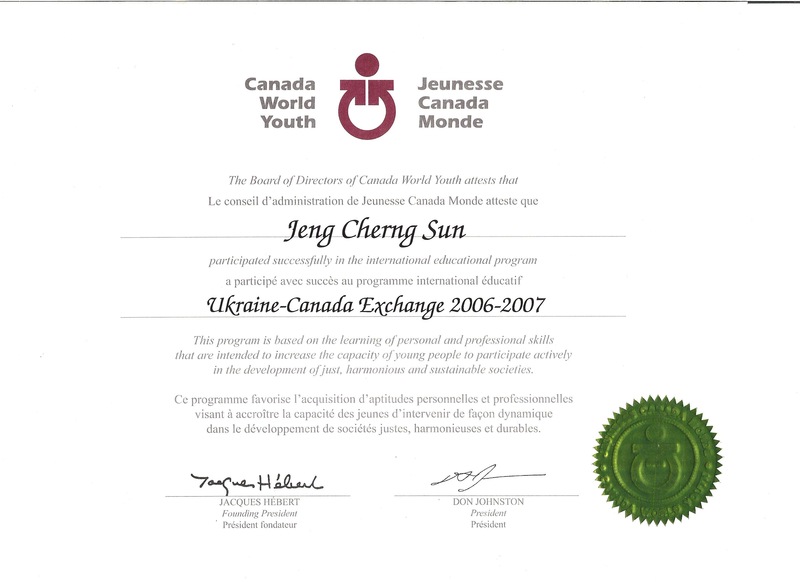 My artifact is a certificate of participation from Canada World Youth, where I participated in the Core Program that emphasized cultural exchange, volunteerism, and community development. The program spanned six months, half of which was spent in Ukraine while the other half was spent in a small town in Saskatchewan. During the course of the program, we engaged in community service projects and self-directed learning. I chose this artifact because it represents a very tough learning period in my life and my subsequent personal growth. I felt uncomfortable being a visible minority in the culturally homogenous communities we stayed in. I missed home and felt trapped in the program. The small town life was uneventful for a city boy such as myself. Despite the difficulty, I remained determined and optimistic. I wanted to finish what I started and I am very glad I did. How does one even begin to engage in conversation when the other person has a completely different starting point? This experience made me question and think hard about the values I take for granted. From a young age I was taught to value equality and democracy, so much so that I accepted them as “Truth” without ever thinking much about them. From of my exchange experiences, I am now able to educate my students from a more global perspective. I have also learned to value the beliefs and knowledge that are intrinsic to our democratic society, and endeavor to ensure they are well communicated to my students. I want my students to know why equality is important and why racism is hurtful. This experience has inspired me to consider a more broad-minded, critical approach to the way I teach. Rather than adopting a particular stance or attitude without question, I strive to encourage students to explore a variety of perspectives so that their understandings are enriched and deeply felt. In this way they will gain the fullest understanding of any subject matter to which they are exposed. Through the exploration of multiple perspectives, students will come to share, with their teacher, the understanding of the importance of a broad knowledge base in all subject areas.